Chateau Castelnaud is a stunning medieval fortified chateau that sits at the meeting points of the Dordogne and Ceou Rivers. Surrounding the chateau is the lovely village of Castelnaud-la-Chappelle, one of Frances Les plus beaux villages de France or designated Beautiful Villages. Read more about Castelnaud-la-Chappelle on our Beautiful Villages Page. Castelnaud sits high above the Dordogne River in the Dordogne region of Perigord Noir. 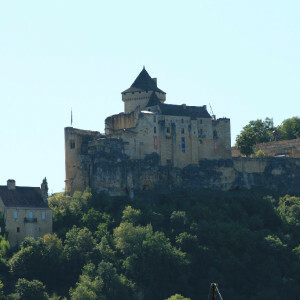 Castelnaud – or Castelnau, meaning the “new castle” – was founded in the 12th century as a defensive fortress and faces its once arch enemy Chateau Beynac across the Dordogne river. In 1214 during the Albgensian crusades Simon de Montfort took the castle from Bernard de Casnac, a supporter of the Cathars (who were also known as the Albgensian) . The Cathars dualist religious beliefs led to them being castigated as “heretics” and Simon de Montfort was sent from the north to crush the Cathars ‘heresy’. De Casnac, regained it a year later and hanged all members of the occupying garrison. He was the driven out again, this time by the Archbishop of Bordeaux, who ordered the castle be burned. The chateau was rebuilt in the 13th century during the 100 years war and from 1337 came under the rule of the Caumont family and was part of English ruled Aquitane. Over the next 100 years many battles took place between Castelnaud and Beynac,its French controlled enemy across the river. The castle change hands several times between the French and the English, resolved only by the French siege in 1442. 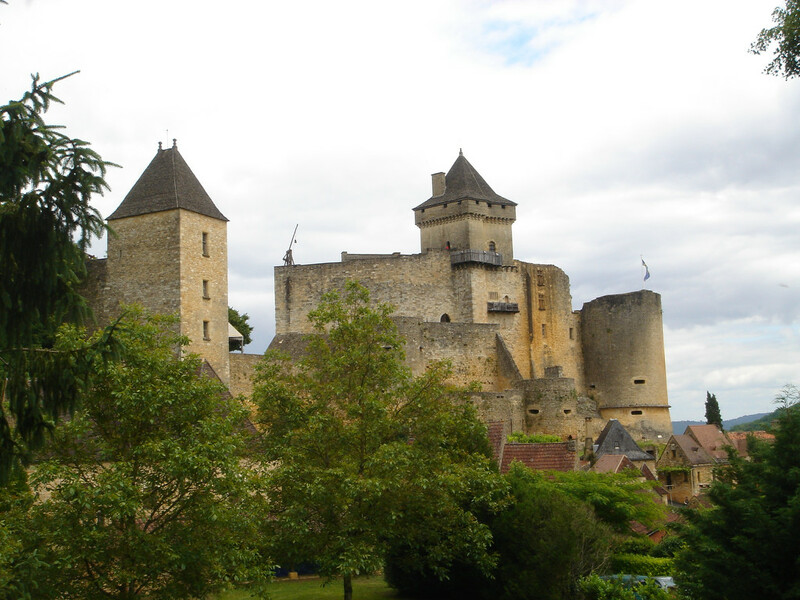 The Hundred Years War was to continue until 1453 after which the Caumont family regained ownership of the castle which they repaired and substantially reinforced. They strengthened its defensive capabilities: gun ports were installed in the lower wall and the new barbican, and the artillery tower was erected. Much of the castle we see today dates from this period. A large new main building was also erected, to try to make the medieval fortress more comfortable. 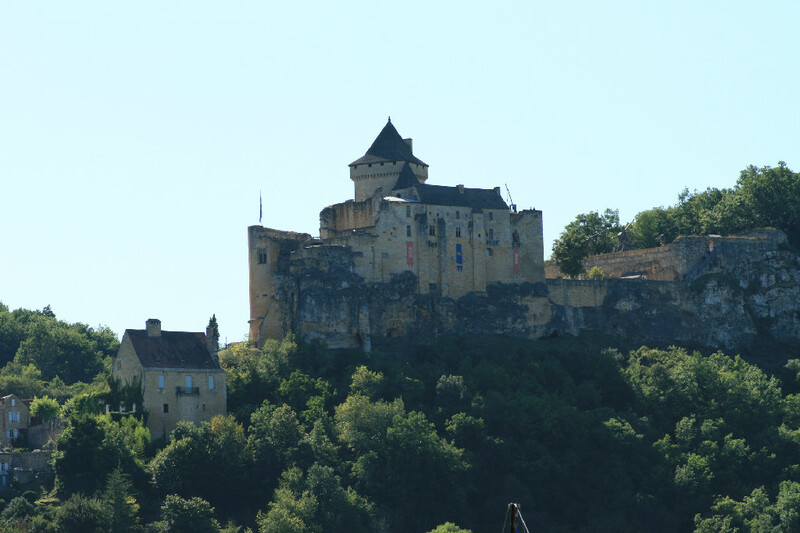 Nevertheless, the Caumonts left Castelnaud to live in their new château at Milandes. 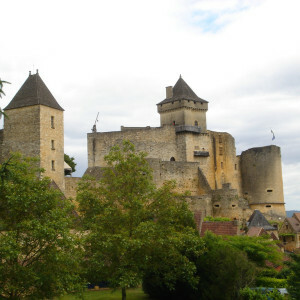 During France’s Wars of Religion (1562-98), the castle was left in the hands of Captain Geoffroy de Vivans, a Protestant soldier nicknamed “The Battler”, who was born at Castelnaud. He was so feared that it was never attacked during that time. In 1966, it was listed officially as an Historic Site and has since been brought back to life through a series of outstanding restoration projects. Its “Museum of Medieval Warfare” was founded in 1985. The Museum of Medieval Warfare, opened in 1985 and is housed in the rooms which were once the living quarters of the château’s owners. It contains a collection of 200 items of arms and armour (weapons for cutting and thrusting, missile weapons, artillery pieces), as well as furniture of the period. The sword was the essential battle tool in medieval times. Originally, designed to cut and parry it had developed by the middle ages into a sword that pierce chain-mail. Other weapons such as pikes enabled foot soldiers to injure horses, penetrate between the plates of a suit of armour, or unseat and spear a cavalryman. The dagger was used to finish him off. The crossbow, more accurate and powerful than a bow-and-arrow, was a weapon so dangerous that originally it was employed solely against the “infidels” (notably in the Crusades). However, due to its destructive ability it soon came into use everywhere. The bows became too difficult for normal pulling and had to be loaded with the aid of a winch, by the end of the 15th century, the jack or pulley-block were used, largely dispensing with the need for muscle-power to bend the bow. Body protection developed between the 11th and 16th centuries. During the first three of those centuries, men at arms were protected by a coat of chain mail. The head was protected by the camail , a mail hood or collar. In the 14th century, as arms and weapons improved so did defensive equipment with plates of cast-iron were affixed to the chain mail. Helmet and head protection also improved, the helm, heavy and uncomfortable, was replaced by a helmet with movable visor. In the 15th century, the wearing of a suit of armour became general. Fully and fitted to the individual horseman, it protected him from head to foot. Armour remained in use until the middle of the 17th century. By then, protection of the body was almost secondary to its display of the wearer’s personal aesthetic tastes, a fashion of the times. Tower-positioned giant crossbow This giant crossbow was used by the defenders of a stronghold from a fixed position. Its advantages were its accuracy and its range: hitting a 1-metre square from 300 metres away. The Pedrero and the Bricole Both were forms of catapult: men pulled on ropes to bend back the arm and then fire stones. Regarded mainly as defensive weapons, they were very effective against cavalry charges. The Mangonel Appearing towards the end of the 12th century, this machine had a fixed counterweight of several tons. 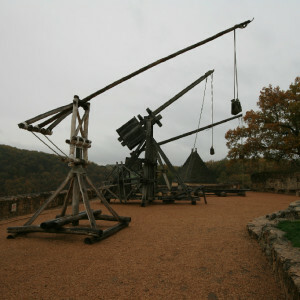 The TrebuchetAlso using the counterweight principle, this machine was in use up to the 16th century. 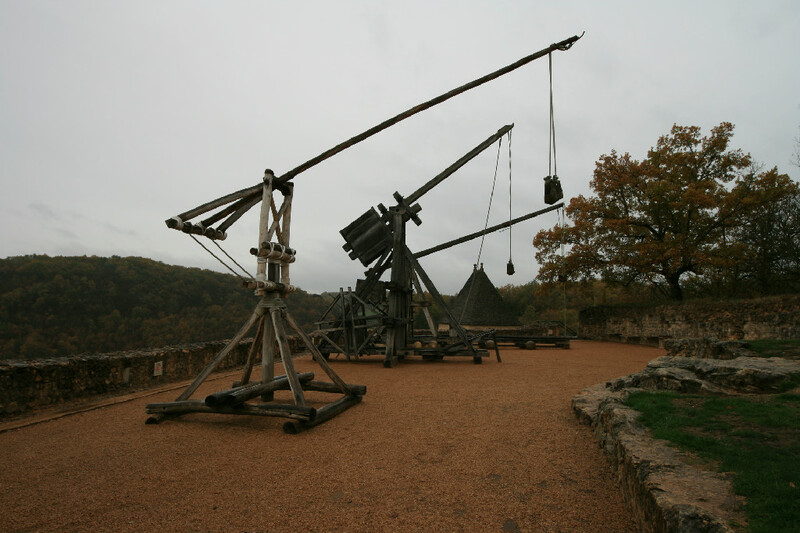 Despite its low rate of fire – only one or two per hour – it was the most powerful machine used in the Middle Ages. Many places under siege capitulated as soon as they saw one arrive. The Bombard The first forms of artillery using gunpowder appeared in the 14th century. Handling them was a delicate matter. Before reloading, the gunners had to wait for them to cool down. Result: their best rate of fire was only once an hour.